Most foreign investors in India complain about the poor infrastructure and chaotic traffic in the country, but one Russian company sees it as an opportunity to implement intelligent transport systems. NIS GLONASS, Russia’s national navigation services provider is the lead sponsor for this year’s Intelligent Transport Systems India conference, which will be held in Delhi on February 27-28. Vladimir Finov, Managing Director and CEO of NIS GLONASS’ India operations shares his insights on the company’s prospects in the Indian market. Every time there is high level India-Russia Summit, we read about India’s imminent participation in the GLONASS project. Can you tell us in what way India is cooperating with GLONASS at the moment? There are many ways in which India is participating with us. The first is government to government relations; that is regarding the launch of GLONASS satellites and getting access to the military signal of GLONASS. Another cooperation that is going on is in making commercial usage of GLONASS signals for India and its people. This includes the development of the telematics business in India, the utilisation of GLONASS signals from receivers and other technology developed in Russia. Is the private sector also involved in the scheme of things? While the government is still supporting us, business to business is the main direction of GLONASS in India at the moment. What are the main verticals that GLONASS is focussing on in India? Right now, the Indian Government is quite active in the implementation of ITS, Intelligent Transport Systems, in various cities of India including Delhi, Mumbai, Bangalore and Chandigarh. At GLONASS we are looking at working on the passenger transport system and passenger information system for buses, including inter-city buses. Another vertical is infrastructure development for companies that have heavy machineries outside cities in very remote areas, where the machinery needs to be managed properly. Another very big, but unorganised sector is logistics companies. Transportation and logistics companies, many of which are small and medium enterprises, have trucks and fleets of their own but don’t have the ability to efficiently manage them. Would an ordinary passenger on a local or intercity bus in India benefit from this system or are we mainly looking at it from the point of view of the authorities that run the buses? This is mainly used between the control room and the drivers so that the buses are always going on time and not bypassing stops, but passengers would also receive information about when the next bus would come to the stop. They should be able to see that information in the bus stops and they can even see this information on their mobile phones. This kind of service is already available in Russia and is in the stage of pilot implementation in Mumbai by various companies. 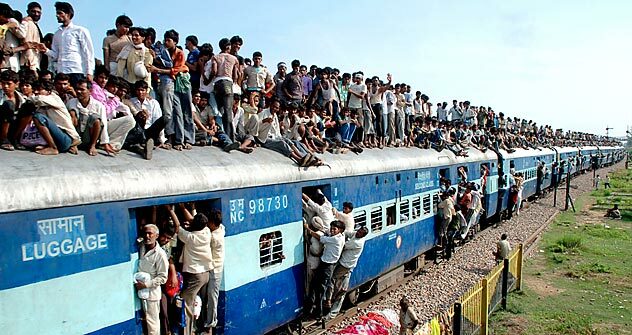 Are there any plans to implement these systems for the Indian Railways? The logistics are the same in Russia and I would say as for now, the Indian Railways is starting to implement GPS-based LED boards for coaches, which again will provide some kind of information about when the train will come to the station. Some projects are also going on in the development of anti-collision systems for the railways, where locomotives can be tracked on the basis of GPS again. We have already developed and implemented a train management system in Russia. We offered and approached the Indian Railways offering them this solution. I do believe that the wait will be long as I have experience with the Indian Railways and they tend to adopt new technologies quite slowly. I don’t mean this is as a criticism, but in passing through applications, approvals, trials, before the technology will be implemented it may take up to 3 years. We do have a solution, which we are happy to offer. How else would India benefit by using GLONASS technology vis-a-vis GPS for instance? Glonass is implementing all the applications that GPS has and at GLONASS we are offering a dual system GLONASS-GPS. All applications that use GPS can be replaced with GPS-GLONASS and you can see the area of our potential market. Would using GLONASS prove more economical for India? Economically, there may not be so much of a difference. We are not saying that it will be less expensive but we will be able to provide greater reliability, accuracy and security. Many American and European companies have used our dual system and have found that they have many benefits for the user, for the companies, for the consumers. What are the opportunities and challenges that GLONASS sees in India? To some extent, chaotic traffic is not an obstacle and is actually a reason for implementing ITS systems. The biggest challenge is the competition from low-cost manufacturers who don’t care about the quality or reliability of the product, but prefer to complete only on the price level. Without taking any names, I’d like to say that they are trying to use the cheapest possible components, the cheapest possible technologies, without quality control and they flood the market with cheap products that are unreliable and which is ruining the market. That’s an area that we don’t want to enter, because we take care of our services, our quality, our products. We are not going to compete on price. We are going to compete on quality of service and support and feature-wise. There are many competitors that say, ‘buy ours, because ours is the cheapest,’ and that is the biggest obstacle to the development of the market at the moment. Recent media reports from Moscow have indicated that the Russian Government would be investing about 346 billion roubles on GLONASS. Are we looking at any potential investment in India in the near future? This question would be more relevant to the Roskosmos and the Russian Government, but we are using and promoting the results of that investment. This particular investment is meant for maintenance and for providing non-interrupted services of the GLONASS constellation (network of satellites) around the world. As long as GLONASS satellites will be up and running without interruptions, without any reduction of services, by that way, this investment will help us promote our business here. Can you tell us about GLONASS participation in the Intelligent Transport Systems India conference? This is the second edition of the annual conference, which deals with the implementation of intelligent transport systems in India. It is about obstacles and problems and case studies in various cities in the country. Many public transportation corporations will be participating in the conference, including those of Delhi, Bangalore. They will share their experiences in implementing these pilot projects. We will be presenting our solutions, which are well proven in Russia and were implemented in Moscow and some other cities and some pilot projects in India. We will learn very carefully from the experience that India already has in this particular area and try to help sort out the problems, which India may have faced. Where do you see GLONASS’ India operations in the next few years? We are not just speaking about GLONASS; we are speaking about solutions for traffic management, navigation and telematics on the basis of GLONASS and GPS together. GLONASS as of now is very much promoted and developed all over the world. I mean the GLONASS signal. Apple iPhone already has GLONASS support. Sony Ericcson, Nokia and others have plans to implement GLONASS in their smartphones this year. So this technology is becoming acceptable worldwide. India has a choice: either be on the backseat or be a driver of this technology in the world, outside Russia.